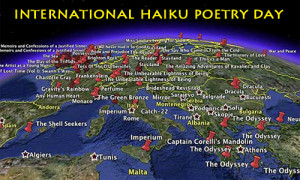 You are here: Home / EarthRise Rolling Haiku Collaboration / Today Is International Haiku Poetry Day 2019! The United Nations has designated 2019 as Year of the Indigenous Language. Plan to share one poem or many in the world’s largest collaborative poem — last year we had over 500 submissions! (Perhaps we ought to give The Guinness Book of World Records a call . . .) Beginning at 1 minute past midnight at the International Dateline. Terri L. French writes: I will read next Wednesday night at Redstone Village Retirement Community “Poetry Night” in Huntsville, AL. I will be reading several haibun, including a few from my book, Keepers. And we here announce the results for the 2018 Touchstone Awards. The Haiku Foundation is pleased to announce The Touchstone Distinguished Book Awards Award Winners and Honorable Mentions for books of haiku and related forms published in 2018. The sixty-seven books nominated for this year’s award represent a rich variety of English-language books from many nations and haiku traditions. In the first round, each panel member read a variety of books and nominated three books which formed the Shortlist. In the next round the panel members read each book on the Shortlist and through a series of votes and discussion, arrived at three Award Winners and three Honorable Mentions. I speak for the entire panel in saying that everyone recognized that each book on the Shortlist was unique and excellent and can attest to the difficulty of distinguishing the ‘best’ of the books. As one member exclaimed, “What a group of books we had this year!” I wish to thank the panel for their diligence, expertise and effort. • Wishbones: Haiku & Senyru. Ben Moeller-Gaa (Meredith NH: Folded Word Press). • Unsealing Our Secrets: A Short Poem Anthology About Sexual Abuse. Alexis Rotella, Curator/Editor (Arnold MD: Jade Mountain Press). • Shades of Absence. Harriot West (Winchester VA: Red Moon Press). • A Thousand Years. by Marco Fraticelli (Carlton Place ON: Catkin Press). • Okinawa. Kai Hasegawa, translated into English by David Burleigh and Tanaka Kimiyo. (Winchester VA: Red Moon Press). • The Tender Between. Eve Luckring (Princeton NJ: Ornithopter Press). • Broken. Steven Carter (Uxbridge UK: Alba Publishing). • old song: The Red Moon Anthology of English-Language Haiku 2017. Jim Kacian et al., editors. (Winchester VA: Red Moon Press). • senior admission. Bill Kenney (Winchester VA: Red Moon Press). • A Piece of the Berlin Wall. Marcus Larsson (Winchester VA: Red Moon Press). • My Afterlife. John Martone (Charleston IL: Tufo). • Simple Gifts. Natalia L. Rudychev (Winchester VA: Red Moon Press). • Night Ferry. Kim Richardson (Uxbridge UK: Alba Publishing). • An Unmown Sky 2: An Anthology of Croatian Haiku Poetry 2008-2018. Durda Vukelic Rozic, editor. 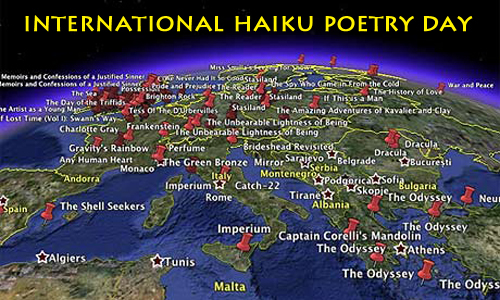 (Croatia: Haiku Association “Three Rivers). • Tsugigami: gathering the pieces. Valorie Broadhurst Woerdehoof and Connie R. Meester (Winchester VA: Red Moon Press). like to thanks all the editors and individual haiku poets who nominated poems published during 2018.
the nominated 57 haiku down to the Shortlist. The Shortlist includes at least top three or four haiku chosen by each panelist. After the Shortlist is selected the panel is open to communicate about the poems and vote two more times to arrive at the Awarded poems. Throughout the process the selection is a ‘blind’ as the panelists do not know where the haiku was published or who published it. Six poems out of over 800 made it to the Awarded category! Reflecting the various haiku sensibilities of the panel, the Shortlist includes a range of traditional to experimental haiku, and this year there were three single line haiku. Twenty-one haiku on the Shortlist haiku were nominated by editors, and eleven were nominated by individual haiku poets (there are 31 haiku on the Shortlist due to a tie). Award recipients are listed below in alphabetical order by author, not by merit. stepping stones . . .
We will honor each of the winners over the course of the next several days with their own posts, and commentaries on their winning work. Congratulations to the winners and heartiest thanks to the judges for their time and thoughtful consideration of the entries. What a wonderful selection of award-winners! A wonderful selection of award-winners – congratulations to all!